Well my new Grizzly G5072 air filter showed up today and I just finished hanging it. Packaging was in real good shape and the unit itself seems really solid so does the overall quality. With the Grizzly I should have a turnover rate of about 20/hr vs the 7/hr with the Performax. the pull cords on all the lights. Some are over 8-10 feet away on the intake side. Seems like real nice circulation. I was a little nervous about hanging this unit alone it weighs about 55 lbs and is pretty awkward to handle. 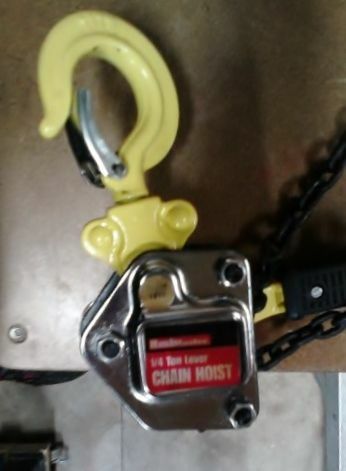 a 1/4 ton ratchet chain hoist. Man that was way to easy. The remote seems a little light duty, however I was able to pretty mush control the cleaner from almost anywhere in my shop. The Performax was a narrow and short line of sight. 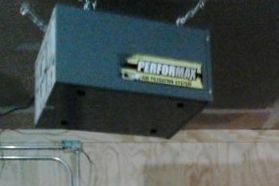 I am still going to keep the Performax and have not decided if I’ll just use it at the bunch or hang it elsewhere. At this point I would recommend this unit. I’ll post an update after using awhile. Looks good, should help the dust! The chain hoist is a good thing too, I bought one and used it to assemble my 14” bandsaw. I sure hope that you are using a dust collector on your tools and the air cleaner for the fine particles in the air. It looks that is the case. I’ve had my Grizzley oh, just short of a year now, and I love it. My shop isn’t dust free by any means, but what a difference from what it was. A friend heard me boasting about my new air cleaner and went out and bought one bigger better and much more costly of course. I do have a 2 stage dc. Right now it is modified HF, Thein Baffle on a 35 gallon can and a Wynn canister filter. Currently I do not have the shop ducted and have to lug the dc hoses to each machine. I have already noticed a difference in the shop with the new air cleaner. Your system sounds allot like mine. I put in ‘Y’ connectors in the duct near each machine and a flex hose to the machine and use a blast gate. (Read here: that I’m to lazy to lug the hose around). I ducted my shop with 4” big box PVC Drain pipe, and have never had any problems. The Wynn canister is a great add on to the HF dc, I recommend them to everyone. So Kurt, how is the new air filter working for you? I am in the market for my first DC system, but my head is spinning with all the info and choices. I’m leaning towards the grizzly G0703HEP and a yet undecided air filtration unit. 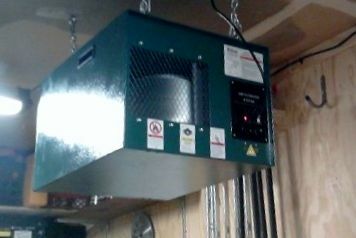 I m leaning towards the grizzly G0703HEP and a yet undecided air filtration unit. Buy the air cleaner for sure! The thing has been one of the best purchases I have made this year for my shop. The thing really works like a charm. It is amazing how much airborne dust that thing captures. The shop is much cleaner now. I am contemplating a new DC and have considered the grizzly cyclones. Check out Jay Bates on youtube, he recently talked about his grizzly dc. I believe his is the Grizzly G0703P. I am sure the hepa filter would be a plus. Also I’d take a look at http://www.jpthien.com/smf/. Let us know what you end up with and what you think.